Click ahead to see more. 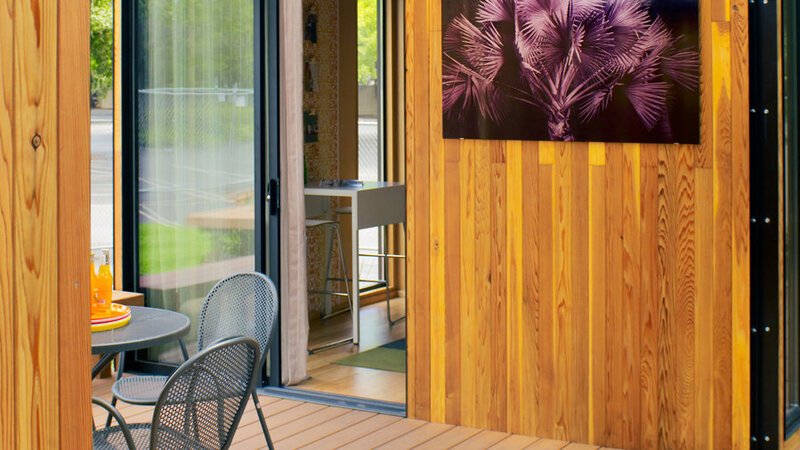 The deck bridging the two units creates an elegant outdoor dining room, accessible from both rooms. 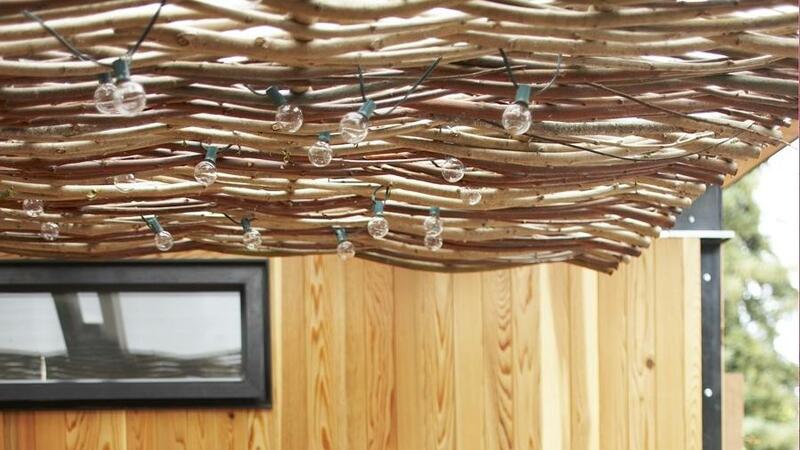 We visually connected the two cabanas by installing a 9’ x 9’ willow panel created by The Willow Farm. 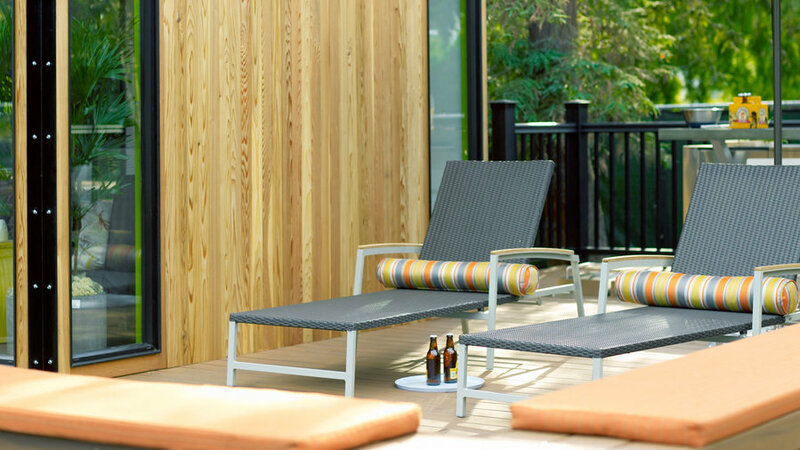 The panel shades the outdoor dining space and offers textural contrast to the FSC-certified clear inland cedar siding from Natural Forest Distribution. We used plantings to create layers of interest to the cottages’ facade. Bella Vita Garden Design created the planting beds with art and design in mind. 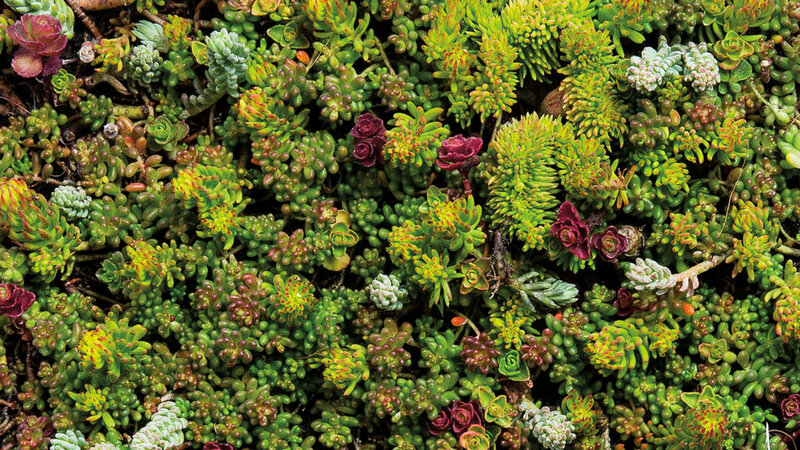 The varied succulents are a low-water landscape choice that creates a sculptural effect. 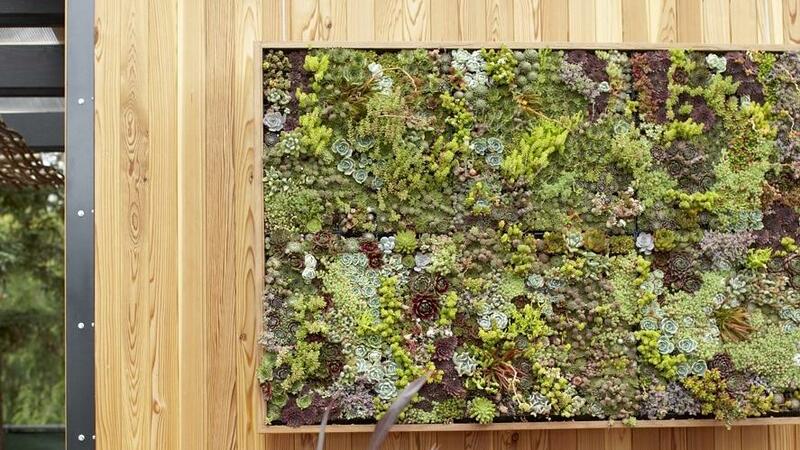 A vertical wall of succulents by Flora Grubb Gardens hangs at the front of the guest suite. Get a closer look at that next. 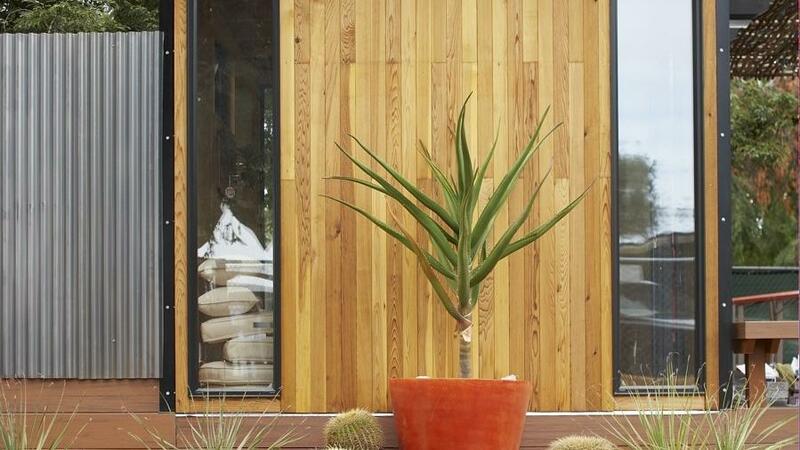 The succulents, packed into their vertical outdoor planter, create a living mosaic of shapes, textures, and color. 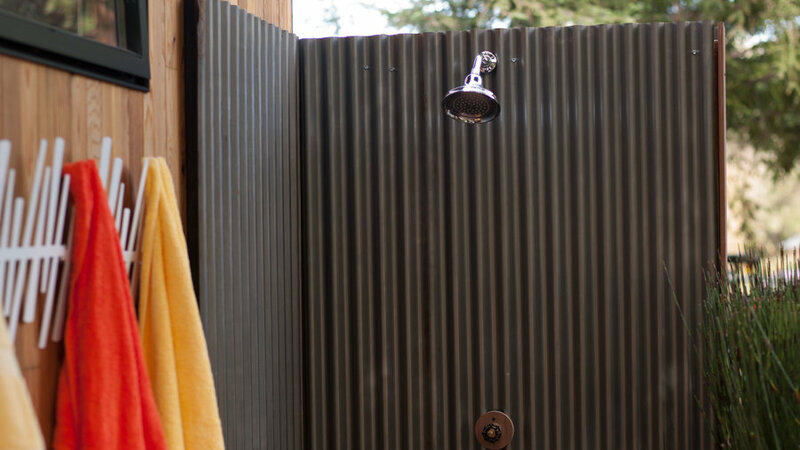 A refreshing outdoor shower is just the thing for outside an office (or painter's studio, or beach cabin...). A "Slat Rack" (here, holding towels) by Wallter doubles as exterior art. The deck of the Modern Cottage Idea House is made from a composite material by TimberTech which requires no painting, staining, or sealing. 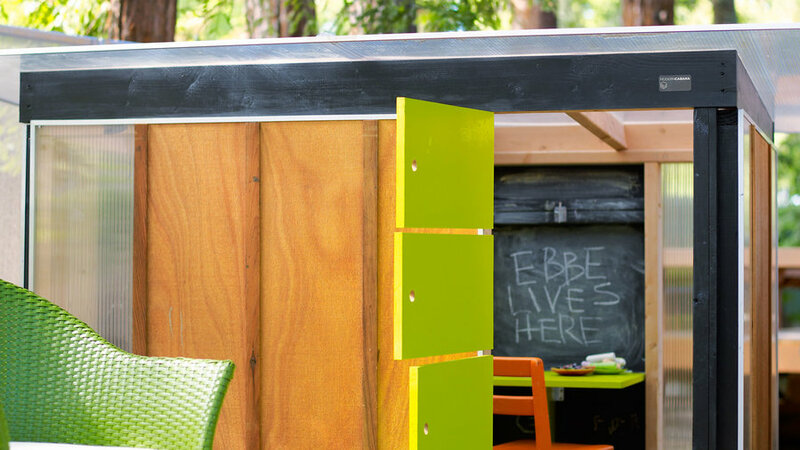 We used it as a platform for a lounge area off an outdoor kitchen. 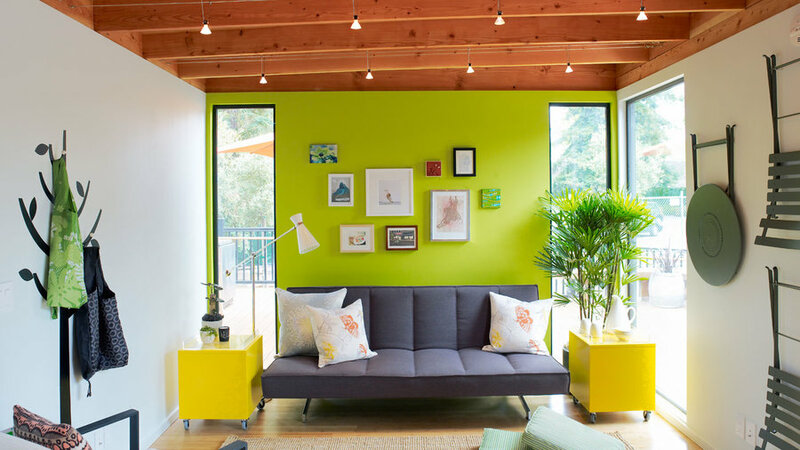 Living-area space savers include a CB2 Flex sofa that converts to a full-size bed as well as floor pillows made of sturdy Sunbrella fabric that can be used indoors and out. Eco-friendly bamboo flooring by Armstrong runs throughout both of the units. Sunset worked with The Beholder to curate an affordable art collection. 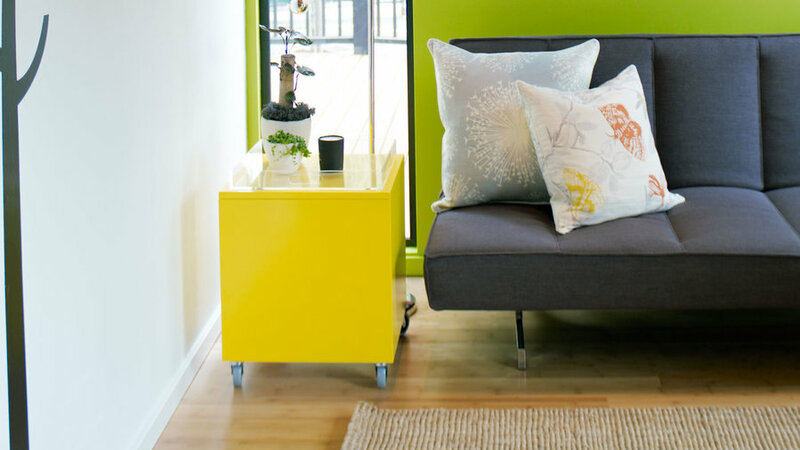 Custom storage cubes on casters located on either side of the sofa house guest bedding. 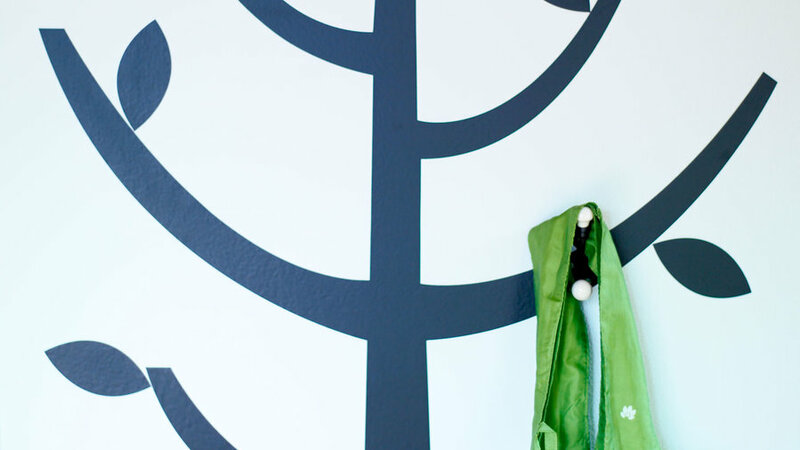 Coat hooks mounted on a wall decal form a functional display. 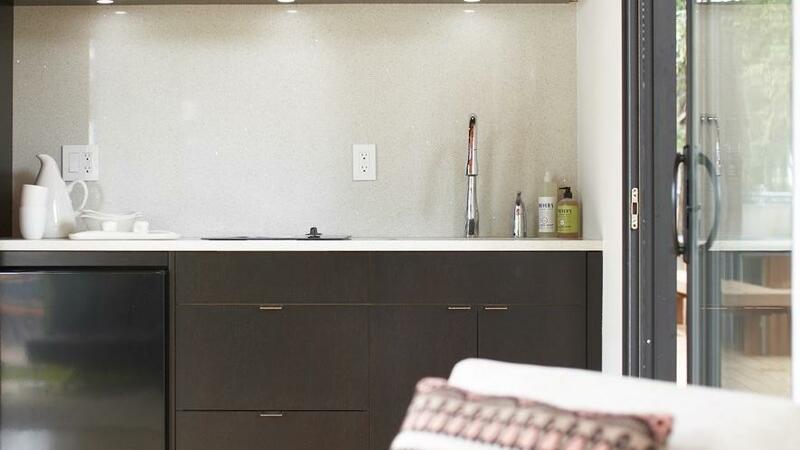 Built-ins and bar-size appliances equip the one-wall kitchenette for guests. The sparkling CaesarStone quartz countertops and backsplash contrast with dark-stained custom oak cabinets. 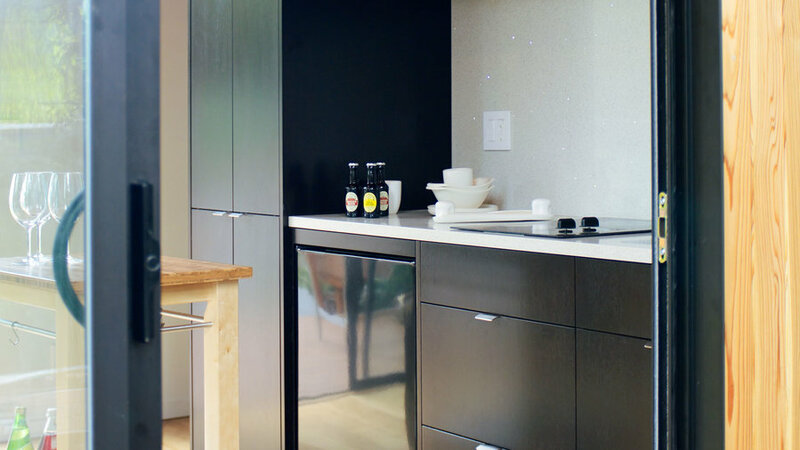 A sleek compact kitchen tucks into one side of the guest suite. The sliding door opens to a back deck with fire pit and outdoor kitchen. 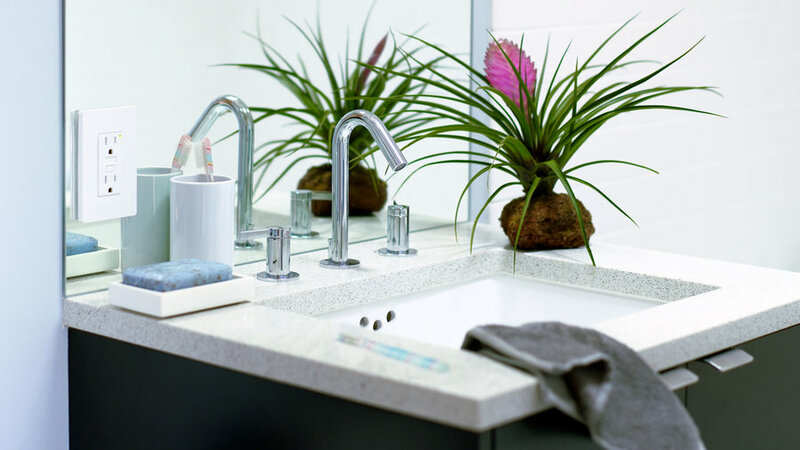 Small but stylish, the custom bath vanity offers storage for towels and toiletries beneath the Kohler sink and faucet. There’s also a clothes closet just outside the bathroom door. 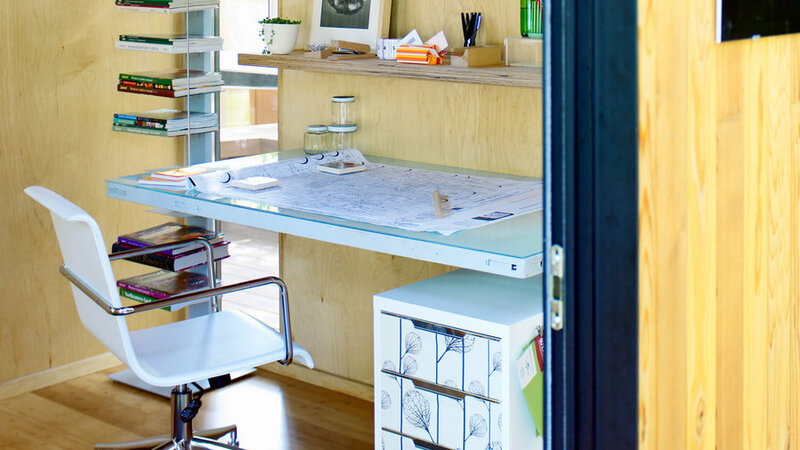 For the office desk, we topped an old door with frosted glass, and suspended it from the ceiling on 3/16-inch cable wire. 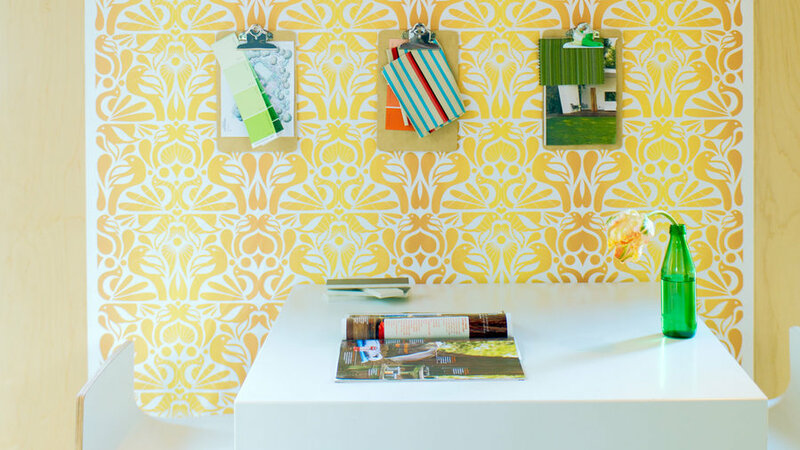 One partial roll of wallpaper and $20 worth of clipboards add up to a snazzy home-office wall. 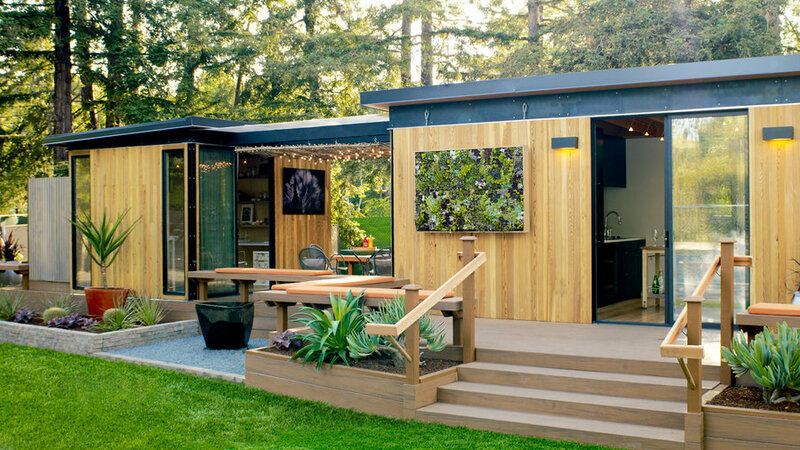 Belgard pavers provide slip-resistant footing next to Modern Cabana’s 4- by 51/2-foot Kiddo prefab playhouse. A tree aloe in a resin pot stands tall against the office wall. 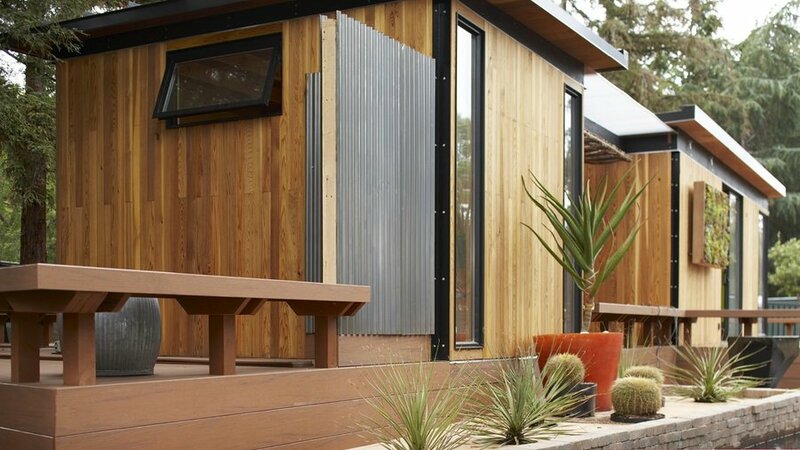 The cottage’s angled metal roof is available with an integrated solar laminate to power the unit. The roof is waterproofed with recycled tire rubber. Base price for the small structure is $12,000; $31,000 for the larger one. The versions shown here are upgrades ($16,375 and $72,500, including appliances). More info at Modern Cabana.